Turns out those plans for elevating Venice aren't even new! [Image: New Scientist, July 2004; worth clicking on to enlarge]. BLDGBLOG has been doing its homework, and we've found that the New Scientist explained all this way back in 2004: "Venice's problem is largely one of subsidence, both natural and man-made. From the 1930s to the 1970s, fresh water was pumped out of underground reservoirs beneath the city to supply surrounding factories. As the water was pumped out of these aquifers – which are rather like rocky sponges – their water-filled pores compressed and the ground sank. Combined with sea-level changes, this has produced an effective rise in sea level of 23 centimetres over the past 100 years." Thus the whole raise-the-city-with-water-pumps idea. "Numerous plans have been proposed to prevent Venice succumbing to the floodwaters, many of them controversial," New Scientist continues. "But if the latest idea gets the go-ahead it will raise more than a few eyebrows. 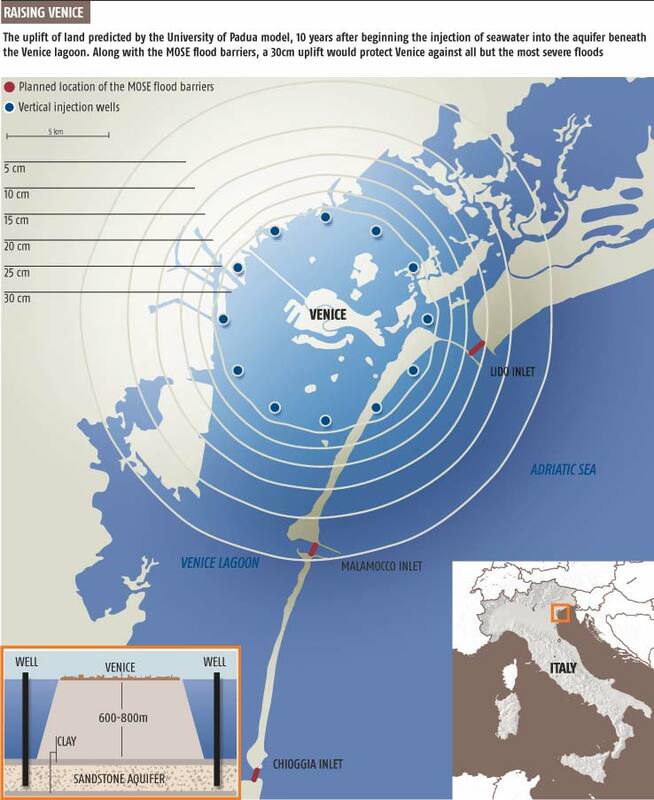 Rather than trying to control the rising water level by keeping the sea out, engineers at the nearby University of Padua want to lift the entire city out of harm's way by raising the ground upon which it sits." But I still think they should put the whole thing onto an arched labyrinth of mechanized legs – inter-connected offshore oil platforms that can walk – and let the city flee inland by itself. King Kong 2: Contro Venezia! The love-crazed simian dukes it out – with Spider-Venice. Personally I think let Venice sink – then give it to BLDGBLOG... Along with the San Andreas fault. Give us that too. And the Grand Canyon. Etc. Inter-connected walking venetian city blocks? Forget Howl's Moving Castle, this would be Howl's Moving Army. The Castello Regiment would be the most bitchin' hard-core black-ops of the army of course. Venice v. Berlin: a whole new urban X-Games. A new Olympics: Tokyo v. Sao Paulo. Walking cities. London blinds its opponents with mist and drizzle while Beijing emits a foul yellow smog. Each with their own strengths and weaknesses. Ultimate Fighter: City Edition. Till the love-crazed simian shows up, of course. 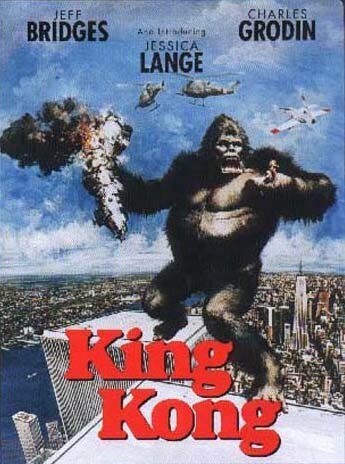 This is, what, King Kong as Baron Haussmann? The great ape urban reformer. Or, amidst this inter-city war, a meteorite obliterates the planet... and all those cities go skittering into space - to duel another day. You can still live in Sofia - but it's floating somewhere near Mars. Sydney's the newest moon of Jupiter, self-connected by motorways and phone cables. How is this plan credible? If Venice was sitting on a single hard crust and would be raised as one, then that would be one thing, but surely this pump plan will lead to variations in lifting, cracks between joined buildings, tilting buildings.... Amsterdam, in fact. i personally believe it could be raised like the oil platforms and may be it does have a point!